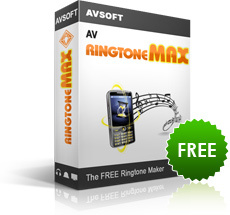 AV RingtoneMAX is a free application that helps users easily make unique ringtones for their mobile phone from their own voice, laughs or singing. It allows users to record their voice, then cut, rip, edit, or mix different audio tracks, and add different cool and funny audio effects to the ringtone in only three simple steps. The final ringtone can be saved sent directly to a cell phone via a Bluetooth connection. Be the first to share your comments about this free ringtone maker.